Have a 1953 wheat penny and want to know its value? Some old 1953 pennies are worth big bucks. Others are worth just a few cents. All 1953 wheat pennies are worth at least double their face value! Was your 1953 penny made at the Philadelphia Mint, the Denver Mint, or the San Francisco Mint? Is your 1953 wheat penny worn from circulation or uncirculated in mint condition? Does your 1953 penny have any varieties or errors — such as doubled dies, off-center strikes, or other oddities? Are there any signs of cleaning, post-mint damage, or other things that may ruin the value of your 1953 penny? Are 1953 Wheat Pennies Rare? Despite how hard it may be to find 1953 pennies in pocket change (let alone any wheat pennies), these old Lincoln cents are actually common — very common. More than 1.1 billion 1953 Lincoln cents were made for circulation. Another 128,800 proof 1953 pennies with special, reflective surfaces and virtually perfect strikes were made specifically for coin collectors. How Much Is A 1953 Penny Worth? Chances are your 1953 penny isn’t worth five figures, but it’s certainly worth more than its face value! 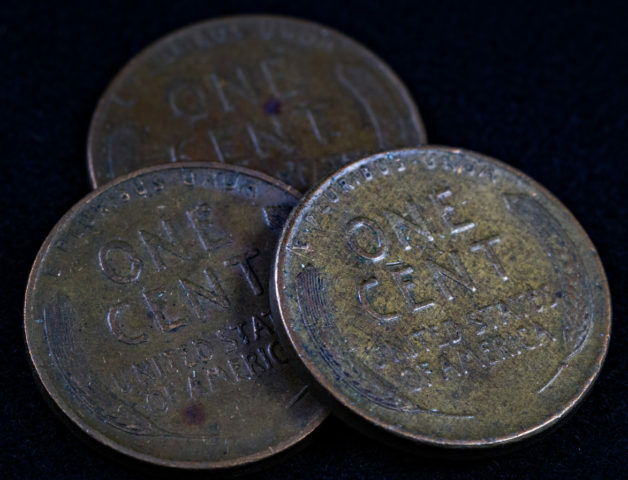 The bottom line… even if your worn 1953 wheat penny has been cleaned or exhibits other signs of damage, it’s worth at least 2 cents — for the value of the copper within the coin’s bronze alloy. Now… what if you have a nicer 1953 penny? Maybe not a $14,000 specimen, but a nice, uncirculated or proof 1953 penny? *Values listed above are for problem-free coins grading Mint State-63 and Proof-63, respectively. While there aren’t really any major errors known among 1953 pennies (unlike, say the 1955 doubled die or 1969 doubled die pennies), there are still plenty of 1953 error pennies floating around! Of the 1.1 billion 1953 pennies minted for circulation, 256,755,000 were made at the Philadelphia Mint, 700,515,000 came from the Denver Mint, and 181,835,000 were struck at the San Francisco Mint. Sculptor Victor David Brenner designed the Lincoln penny in 1909, and his original design with the what ears motif on the “tails side” (reverse) of the penny continued until 1958. Brenner placed his initials “VDB” on the reverse of the Lincoln cent in 1909, but the public thought the letters, placed at the bottom center of the coin near the rim, were too large. So, officials at the United States Mint removed them only a few weeks after the first Lincoln pennies were minted in 1909, making those pennies with the VDB initials very scarce. Brenner’s initials, VDB, reappeared on the penny in 1918 and remain on the coin today. The VDB can be found on the “head’s side” (obverse) under Lincoln’s shoulder. What Else Happened When Your 1953 Penny Was Made? Dwight D. Eisenhower was inaugurated as United States president, following his illustrious military career that saw him as a 5-star general during World War II. Queen Elizabeth II was coronated, becoming the ruler of Great Britain and its commonwealth nations. She became the longest-reigning monarch in British history. The polio vaccine was developed by medical researcher Jonas Salk. It soon became available on a wide-scale basis, saving millions of lives from the scourge of the crippling disease. Soviet Union leader Joseph Stalin died, bringing a new era of reform to Russia and its communist territories under Nikita Khrushchev. Sir Edmund Hillary and Tenzing Norgay scaled to the summit of Mount Everest, becoming the first people ever to successfully do so. The first James Bond novel, Casino Royale, was written by Ian Fleming and published in the United Kingdom. Top movies in 1953 included Gentlemen Prefer Blondes, From Here To Eternity, House Of Wax, Roman Holiday, The War Of The Worlds, Stalag 17, and Walt Disney’s Peter Pan. Popular TV shows in 1953 were I Love Lucy, The Milton Berle Show, The Life Of Riley, The Colgate Comedy Hour, and The Ed Sullivan Show. Top-charting songs in 1953 included “(How Much Is) That Doggie In The Window?” by Patti Page, “I’m Walking Behind You” by Eddie Fisher, “The Song From Moulin Rouge” by Percy Faith, “Vaya con Dios” by Les Paul & Mary Ford, and “You, You, You” by the Ames Brothers.